Yet again, the Champions League has thrilled its viewers to bits, as the star-studded Juventus have crashed out of Europe at the hands of Ajax. Meanwhile, Barcelona beat Manchester United with ease, 4-0 on aggregate, without conceding a single goal in both the legs. Ajax, however, are the dark horses this season. They had to pit their wits against two of the strongest sides in Europe in a matter of three months - Real Madrid in R16 and Juventus in QF. And surprisingly, they have outclassed and outperformed both the sides. After losing to Real Madrid in the first leg at the Johan Cruyff Arena, Ajax beat Solari's men 4-1 at the Bernabeu. 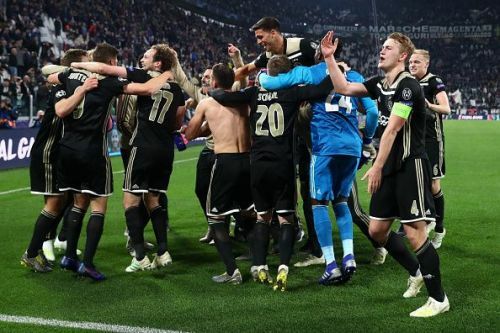 They were yet again held by Juventus in the first leg, but goals from Van de Beek and De Ligt secured a 2-1 win for Ajax, qualifying for the semi-finals of the UEFA Champions League 2019. The likes of De Jong, De Ligt, David Neres, Dusan Tadic, and Hakim Ziyech have shot to prominence this season, and it is possible that some of them may not stay put at Ajax. The big clubs would certainly be preparing to poach the young players out of the high-flying team. But before that happens, it is pertinent to ask the question: what makes Ajax so good? If there is one thing at which they are second to none, it is pressing high up the pitch. Ajax displayed some brilliant team pressing against Juventus as well as Real Madrid, and both the sides succumbed to it. The Bianconeri could not play out from the back, often leading to clearances directly touching Onana's feet or out of play. The home side lacked creativity, and there was no player in a black and white shirt resisting the press comfortably enough. If in case they fail at pressing, the robust defensive players get the job done for Erik ten Hag's men. Juve had their chances, but the duo of De Ligt and Blind put in a 10/10 performance to carry their side across the line. Ajax lost their key player Nicolas Tagliafico due to suspension, but not for a minute did they seem to be lacking that attacking or defensive quality without him. From underdogs to becoming title contenders, Ajax have transformed into a force to reckon with. It is not just the UCL where Ten Hag's men have been impressive. They're also nearing their first league title win since 2014, have scored 106 goals in 30 league games, and conceded just 28. Their league form is nothing short of incredible, and Ajax look set to go the distance at the European stage as well. Ajax possess two explosive wingers in Neres and Ziyech, who at any given point of time can make an incredible through or air pass. They have both heavily impacted Ajax's awe-inspiring run in domestic as well as European competitions, and they are both already being linked to the likes of Arsenal, Manchester United and Real Madrid. Coming back to the game, Ajax had a proper plan, but Juventus did not. Neres and Ziyech ran riot through the wings, utilising the huge spaces left behind by Juve's fullbacks. It could have been goals galore if both the sides had taken all their chances, but Ajax did enough to get the W.
The midfield was non-existent for Juventus, and the likes of De Jong and Schone had enough time on the ball every time they received it. This is the first time Ronaldo won't be in the UCL semi-final since 2010. And that's purely thanks to Ajax's young blood and a brilliant manager in the form of Ten Hag.